These little guys have survived a number of lively parties [hint: dropped] and they are just fine, and I haven't noticed any sweat/condensation. Plus the internal design always brings forth someone saying, "aw, my dad had something just like this when I was a kid." 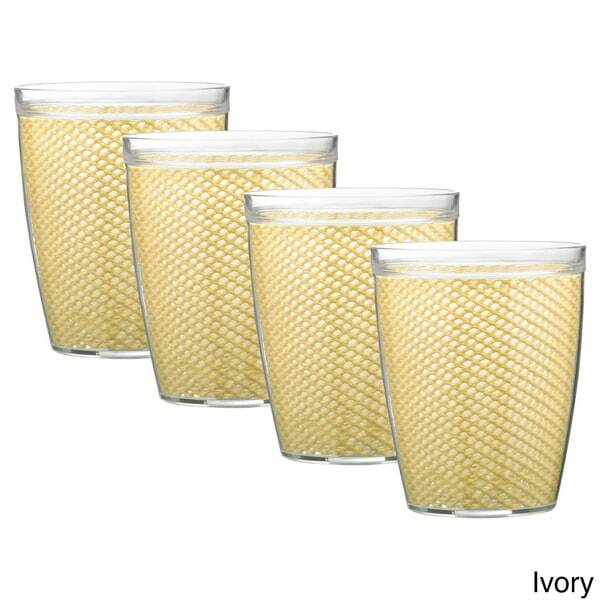 Our Fishnet Double Wall Drinkware is made of high grade plastic and sealed with a sonic weld. This set is durable as well as stylish and is top rack dishwasher safe. Dimensions 14.0 In. X 19.0 In. X 4.0 In. I purchased a set of these on HSN and love them. No wet rings because the glass doesn’t sweat. And it’s thick insulated plastic. I live in Phoenix AZ and own 2 sets of both sizes. Some I’ve owned for almost 5 years and it’s not easy to tell them from the new ones. Should use another color for the photo. Mine are a nice process blue and lemon. I am was so pleased with this set of drinkware . Great quality. Very strong. Highly recommend this purchase. Buying a set for my sister. I ordered this set of cups in white. They do fine in dishwasher and great for kids. They have been dropped and haven't cracked. Just not in love with the design. These double wall glasses really keep your drink cold and the thing I like best they don't sweat at all. My 18 year old nephew loved this set. I purchased them for his first apartment. I wanted something stylist but could also stand a lot of wear and tear. These fit the bill. These tumblers are so nice. I love using them and they keep your drink nice and cold. I got these in Lemon and it looks like the rubber you put under your rug to keep it from slipping. I will keep them because the box was thrown away, but they are not what I was looking for. Matches my 20 oz glasses.